From Route 95: Take Exit 57, Route 113. Follow Route 113 east, a tree-lined residential street, towards Newburyport for about two miles. Turn left at flashing yellow light onto Green Street, a one-way street. Follow straight to bottom. Take a right and a quck left into municipal parking lot. Free parking is on the left side of the lot. 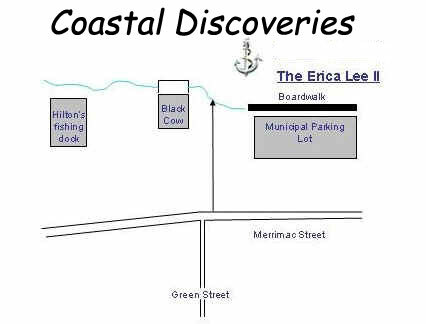 The Erica Lee II is docked in front of The Black Cow restaurant.